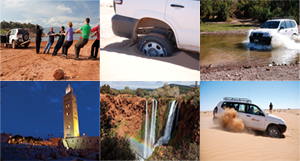 With The Overlanders we have combined the off-road driving with the excitement of discovering the country. As a result we are able to provide such an opportunity and experience which was not available before for a tourist. How many times have you thought about what a great experience would be to drive an off-road vehicle on the Sahara dunes…but immediately set aside for the more adventurous yourself because it came to your mind the cost of such an adventure? How many times did you get excited, when you have seen in a documentary film the world’s untouched places, but you knew exactly, that for those places no travel agencies offer trips, because there is no pool or air-conditioned hotel rooms? If you travel with us, we guarantee an experience you will never forget, let it be in Morocco, Transylvania, Kenya or any other countries of the world where our off-road cars will take you. Our 4WDs will be driven by you, forget the back seat. We offer only round trips, so you won’t have to drive twice the same route. We prefer challenging and difficult access routes. We will take you to places which are inaccessible for an average tourist.